Iceland- land of fire and ice The red triangles mark volcanoes. Walking in the crack Iceland, the island nation (about half the area of Oklahoma) between Greenland and Europe, has very interesting geology. The Mid-Atlantic divergent plate boundary goes through Iceland, so part of the island is on the North American Plate and part on the Eurasian Plate. This is one of the few places on Earth where there is a divergent boundary that is not below the ocean. 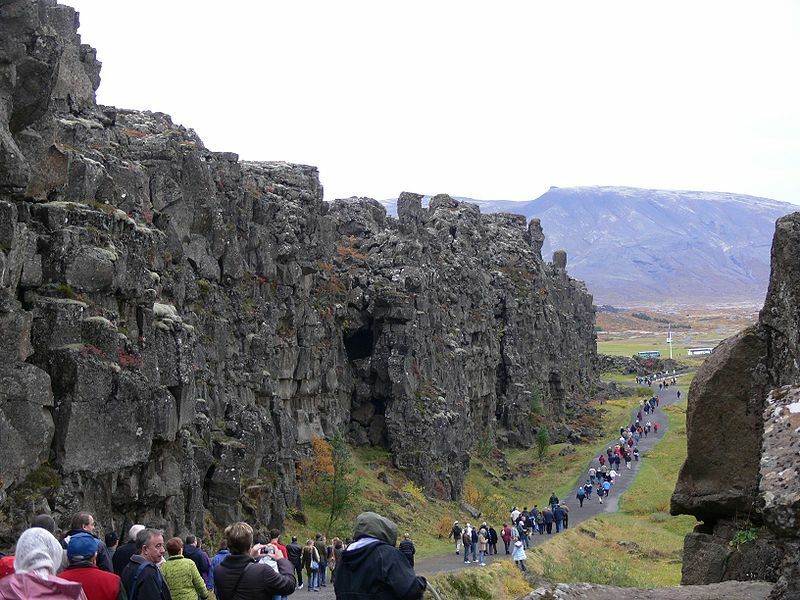 The second picure shows tourists on a path that is essentially the (filled in by rock and soil) crack between plates. Pictures of the Moon and Mercury show thousands of round bowl-shaped holes called craters. 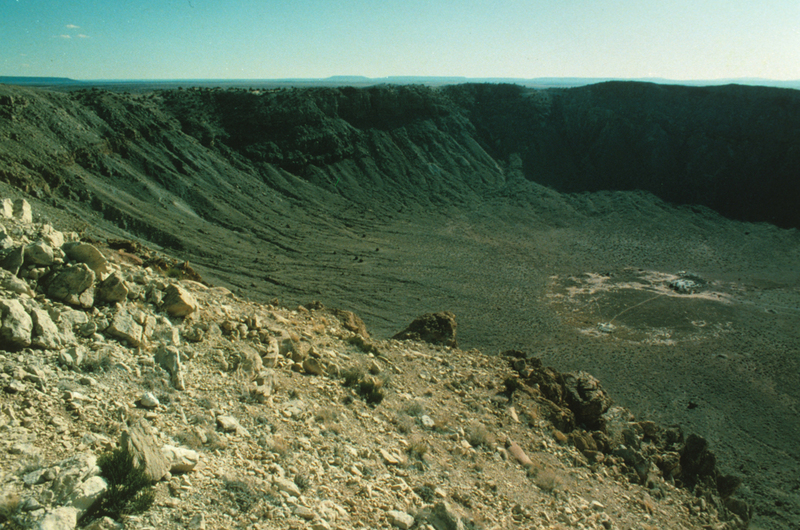 We now know that the vast majority of these are impact craters, created when rocks hit the planets at high speed, rather than volcanic craters. 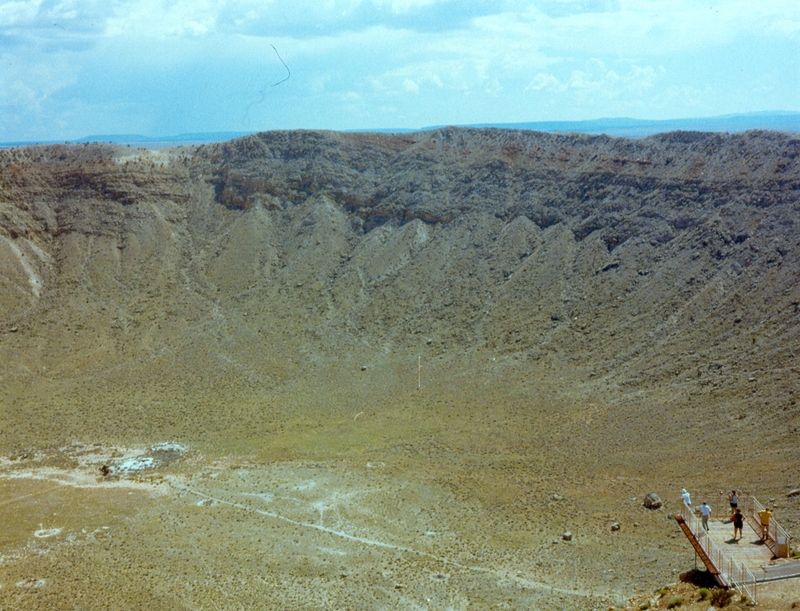 A rock traveling at high speed typically makes a crater 10 times as large as the rock itself. 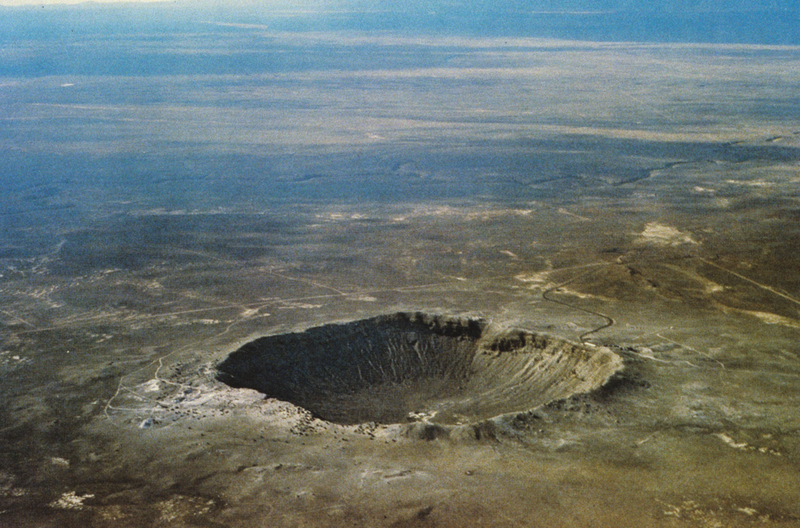 Much of Mars and Venus also have lots of impact craters. 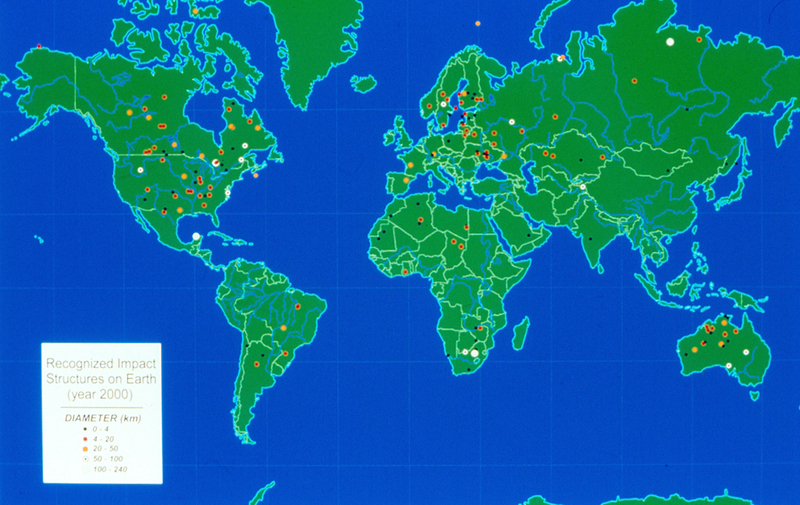 BUT pictures of the Earth do NOT show many impact craters. (Since the Earth is much larger than the Moon or Mercury, we would expect 10s of thousands of craters on Earth if Earth was cratered the same as these bodies.) Why is the Earth different? The answer is *NOT* that the atmosphere protects us from rocks from space. Small rocks do burn up in the atmosphere (shooting stars) but big rocks (SUV sized and up) do not burn up and DO strike the Earth, while the REALLY BIG ROCKS (mile wide or larger) are not even slowed down by the atmosphere. Such rocks would slam into Earth at full speed creating an explosion much more powerful than all the nuclear bombs ever made. Gibbous Moon A picture taken with a telescope of our Moon. 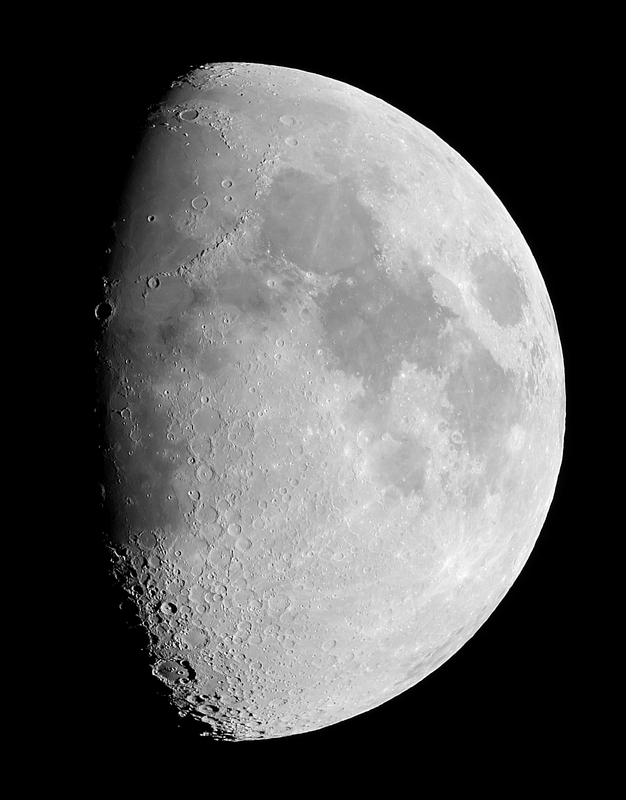 Much of the Moon is carpeted with craters, but large darker areas, called "maria" have fewer craters. 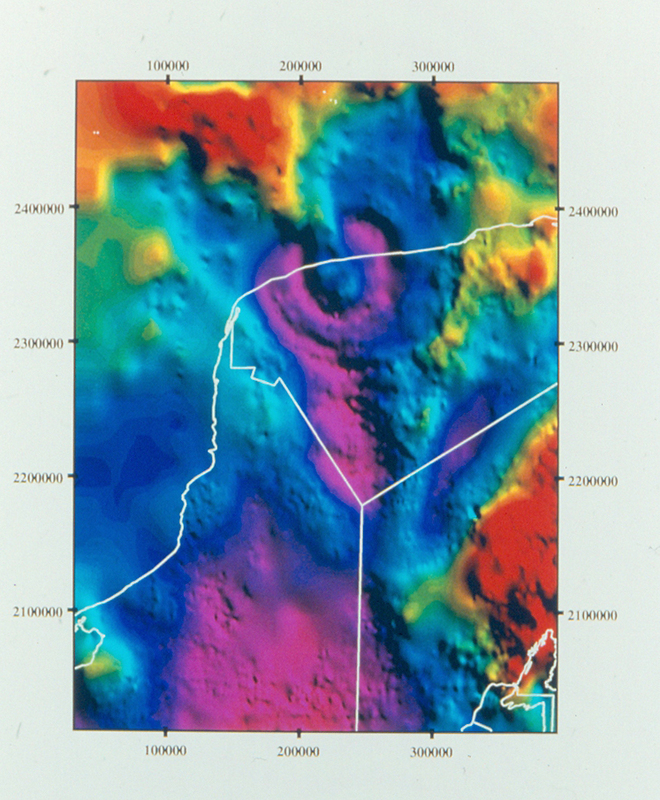 (But we will see that the maria are actually "super craters".) 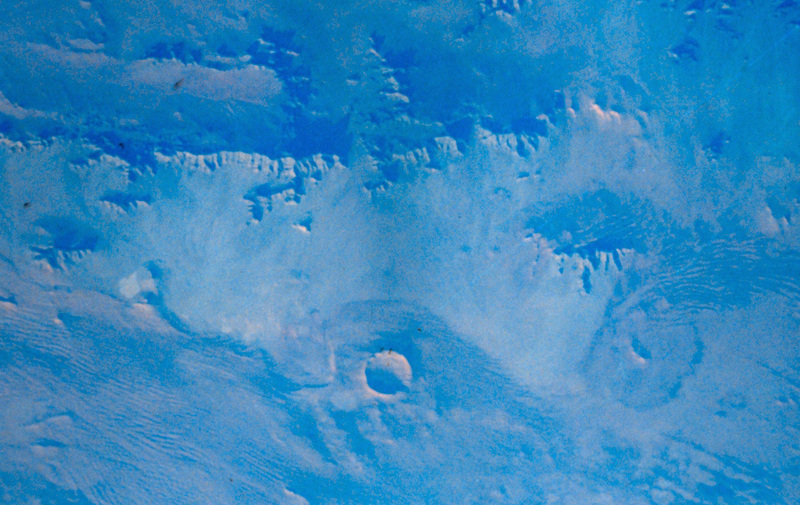 Features such as craters and mountains show up best near the day-night line, as the shadows help highlight the features. Thats why the full moon, with no day-night line visible, looks "flat"- there are no shadows to highlight features. 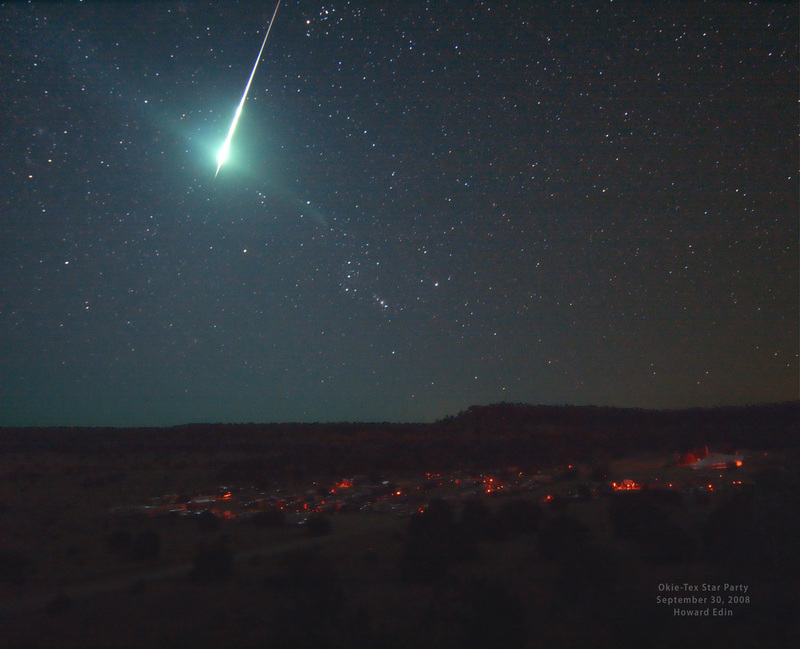 Bright meteor over OkieTex starparty Rocks from space constantly bombard the Earth. If you go out to a reasonably dark place any clear nite, you will see meteors, or shooting stars. Unless you are lucky, you won't see one as spectacular as this one (but who knows, you might!!). Typically, one can see a dozen or so shooting stars per hour from a dark place. Most shooting stars are small rocks as big as peanuts or golf balls. These rocks burn up with a flash as they are heated by friction as they plow into the air. 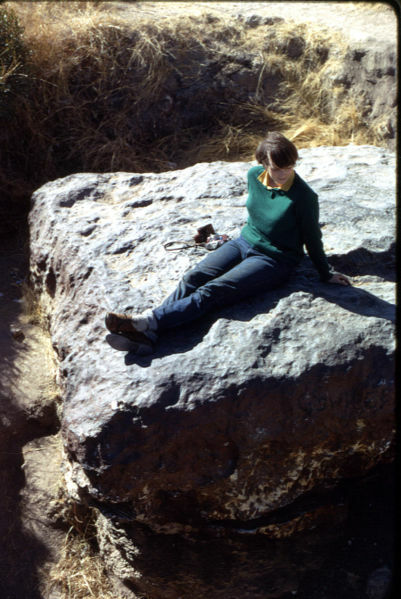 Somewhat larger rocks, say football sized or larger, can make it to the ground as meteorites. The rock that made this spectacular meteor may have been as big as a grapefruit or basketball- as far as I know, no one has found any pieces of this one- it could have burned up completely. Every fall the Oklahoma City Astronomy club (www.okcastroclub.com) holds the OkieTex star party, one of the "Top 10" star parties in the US. For the past few years, OkieTex has been held at the western end of the Oklahoma Panhandle- a fantastically DARK site. I had the honor of giving several talks at the 2008 star party. 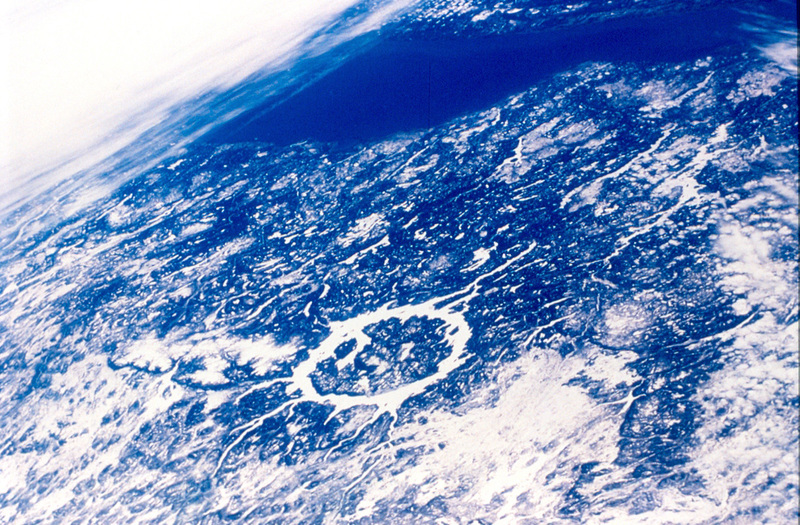 At the 2008 OkieTex, this spectacular meteor was seen. The red lights are the camps of the astronomers, who fill up a large field with campers, tents, and of course all manner of telescopes. 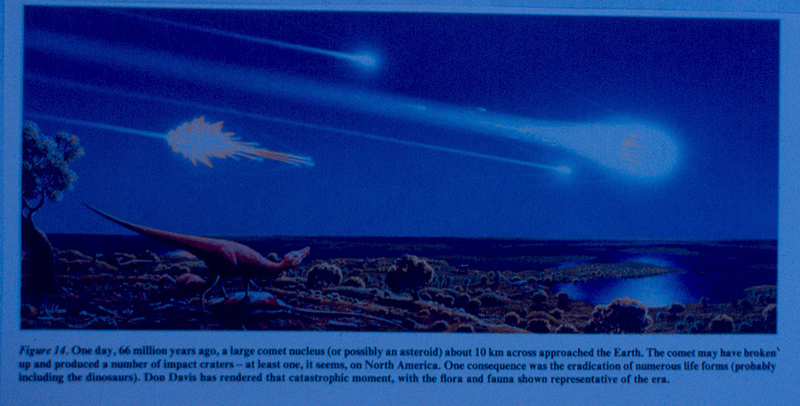 (Unfortunately, I was asleep when the meteor came by!) The 2011 party runs from 24 September to 2 October. 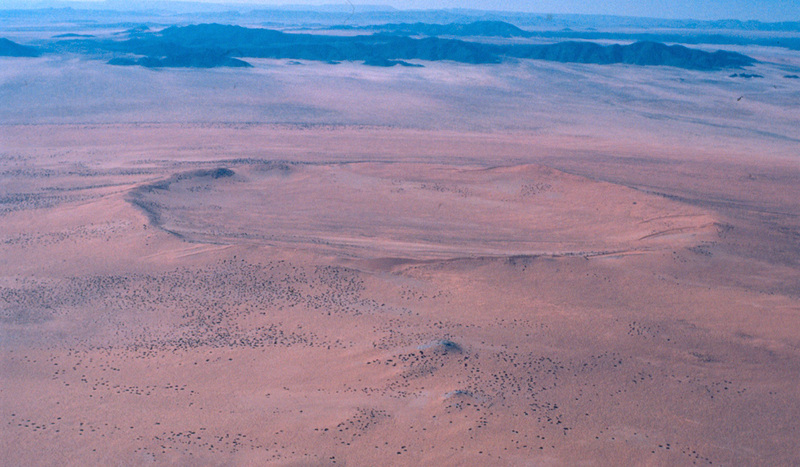 Hoba meteorite This is the famous Hoba meteorite, located in Namibia. It is about 2.5 x 2.5 x 1 meter in size (roughly the size of a car) and is thought to have fallen to Earth about 80,000 years ago. 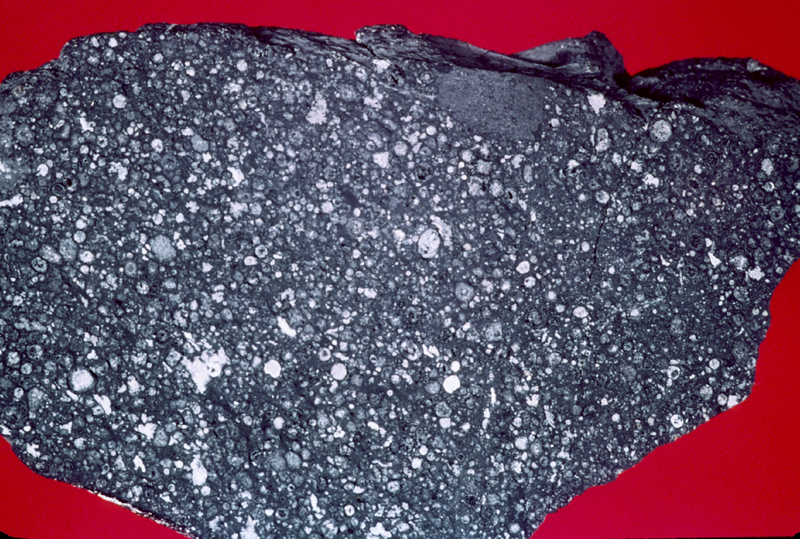 This is an "iron" meteorite, with an elemental composition of about 84% iron and 16% nickel. 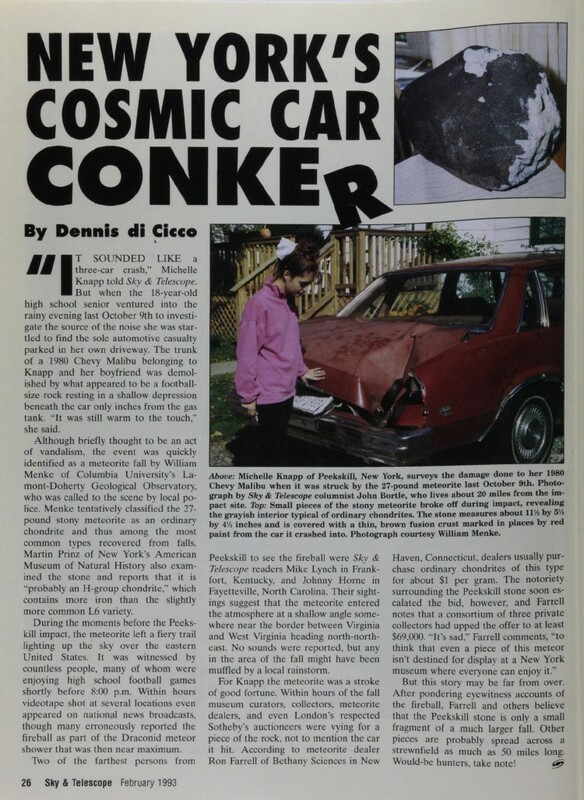 (1) Cosmic Car Conker (2) The car Michelle Knapp, of Peekskill, NY, got her 15 minutes of fame when a football-sized rock from space hit her old junker Chevy Malibu while she watched TV. 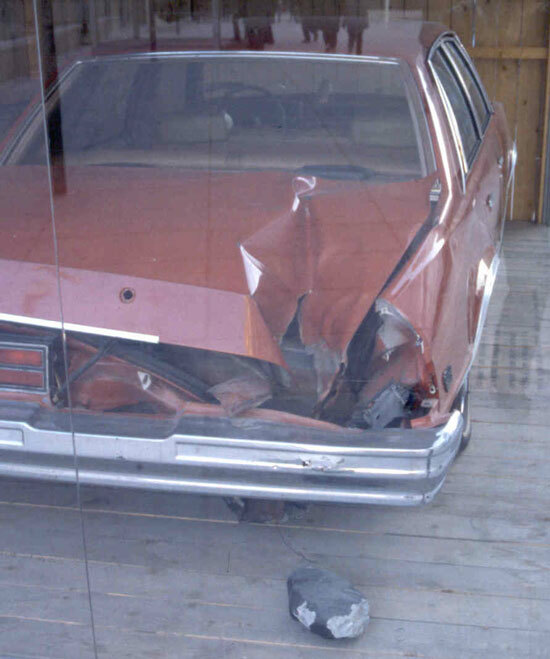 This rock is now known as the Peekskill Meteorite and the Chevy is known as the Peekskill Meteorite Car and has been exhibited around the world! 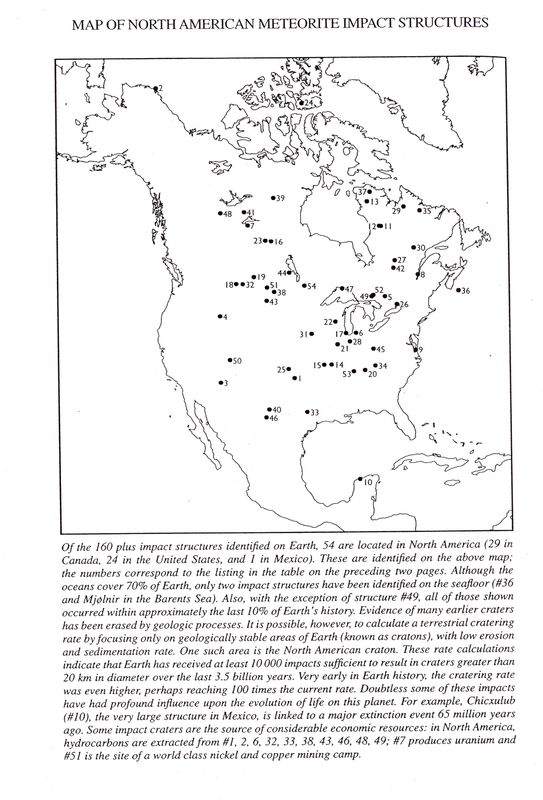 (1) World impact craters (2) North American Meteorite Craters These two images show known craters on Earth and on North America created by the impact of meteorites. (It appears that the US has gotten more than its "fair share" of hits, but this is due only to fact that US has been studied more thoroughly.) Many of these structures are buried and so are not visible from the surface. These buried craters were usually discovered when drilling brought up pieces of shocked quartz rock, a rare type of quartz that can only be made in the intense pressure of a giant impact. 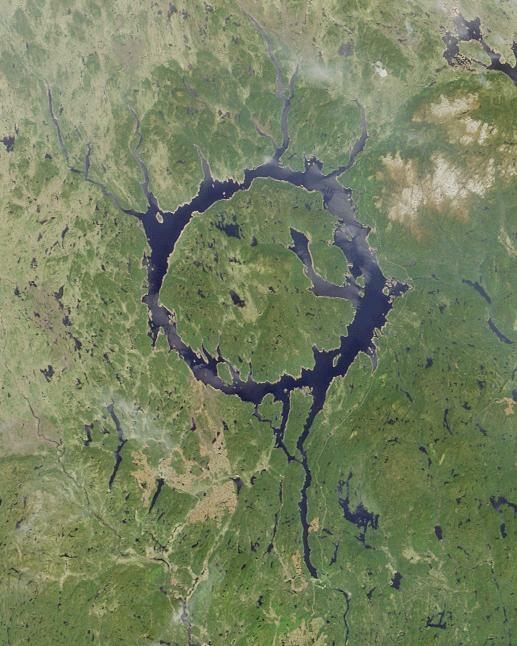 We talked specifically about: #1 - the Ames, Oklahoma buried crater; #3 - the fresh, easily visible (Barringer) Meteor Crater in Arizona; #10 - Chicxulub, the "dinosaur killer", and #30 - Manicouagan, the donut-shaped lake. Geologic Time Geologists and paleontologists divide the Earths 4.5 billion year history into periods and subperiods. This is a simplified chart of geologic time. The time 65 million years ago when the dinosaurs met their end marks an important division, called the K/T boundary. 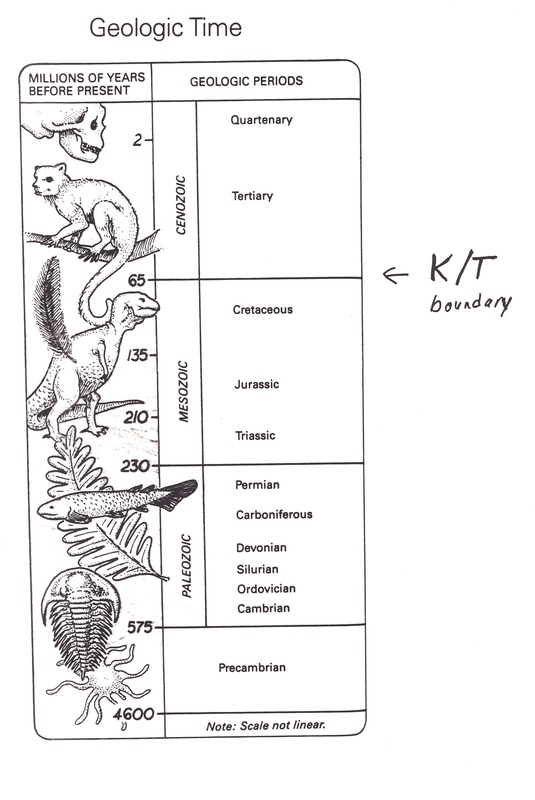 The K/T boundary is the boundary between the Cretaceous and the Tertiary. So why K/T and not C/T? "Cretaceous" mean "chalk" and the German word for chalk starts with a K.
How often do big impacts happen on Earth? 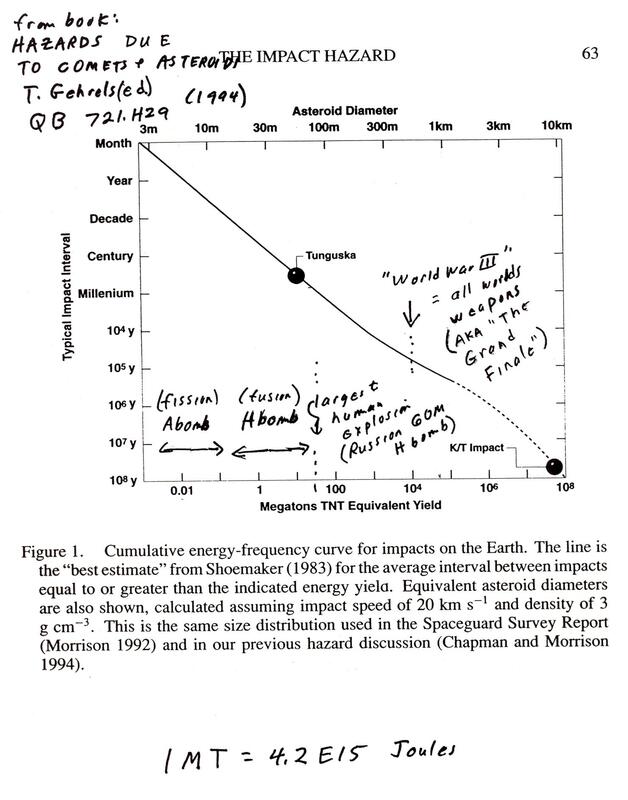 This graph shows the typical time between impacts of different energy. The downward sloping line shows that bigger impacts are rarer than smaller impacts (which is a Good Thing!). 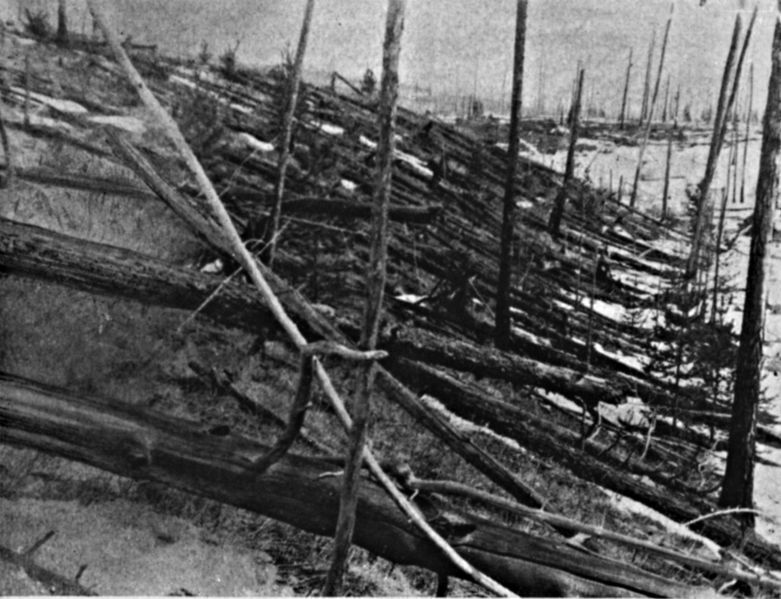 For example an impact of the energy of the 1908 Tunguska impact in Siberia (equivalent to the energy of an asteroid about 50 meters (150 feet) in size is expected to happen every few hundred years. (If you find the point labeled Tunguska and go over horizontally to the "Typical Impact Interval", you see that such events happen every few centuries.) Such impacts might cause great local damage and loss of life, IF the impact took place in a densely populated area. The impact of a 1 to 3 kilometer sized asteroid (roughly 0.5 to 1.5 miles across)(this is about where the line changes from solid to dotted) will happen every few hundred thousand years. Such an event would cause immediate and total devastation over a area the size of a large state. It could also cause large loss of human life through indirect effects- such an impact might fill our atmosphere with dust and acid rain which could cause widespread crop failure, and subsequent mass starvation. If we find such an object on a collison course with Earth, our response will depend on the amount of time we have until impact. If we get only days or weeks of warning, there is little that we can do. With months or a few years of warning, we might at least save some select group of humans by hiding them in caves with ample food supply and air filtering systems (but think about being left on the outside!). With a number of years or decades of warning, we can hope to take direct action to avoid the impact- this would probably involve some sort of rocket mission to the object, perhaps to nudge it into a different orbit so that it misses the Earth.